could make diagnosing disease as easy as exhaling. Let’s say you’re sick. It’s a fever you’ve had for days. Maybe it’s a headache that is getting worse and worse. Or perhaps your vision is blurred. Some system in your body is offline, and it’s bad enough that you need professional advice. You head to the doctor’s office, where a great hunt for the cause begins. Your temperature is taken; your blood is drawn. X-rays or maybe an MRI is ordered. So maybe more appointments, more waiting, all while whatever it was that brought you there in the first place continues unabated. But what if there was a way to halt that hunt during the first visit to the doctor’s office? And what if the test took seconds to administer, involved no needles or claustrophobia-inducing medical equipment, gave results in milliseconds and wouldn’t tax your insurance or your wallet? This is the “Jetsonian” promise of the technology being developed by Konstantin Vodopyanov, 21st Century World Class Scholars Endowed Chair in Optics and Photonics. More than a decade ago, this laser specialist saw a way to use laser technology to find instant, actionable medical clues hidden in the unseen: your breath. 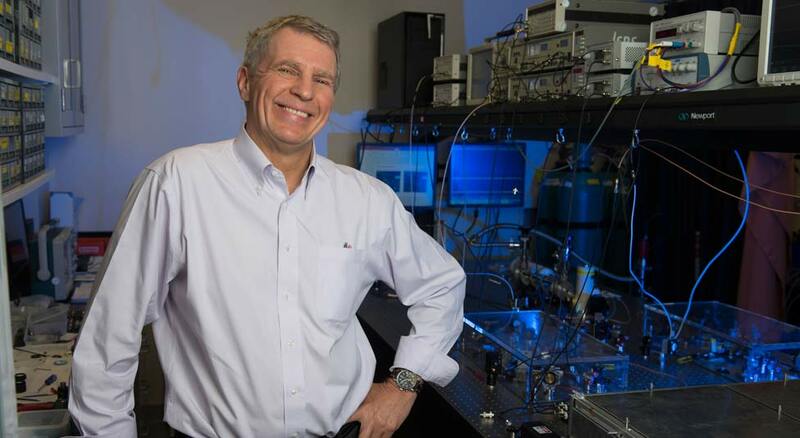 UCF Professor Konstantin Vodopyanov is developing a new laser that’s capable of scanning for diseases as quickly and easily as scanning a barcode. 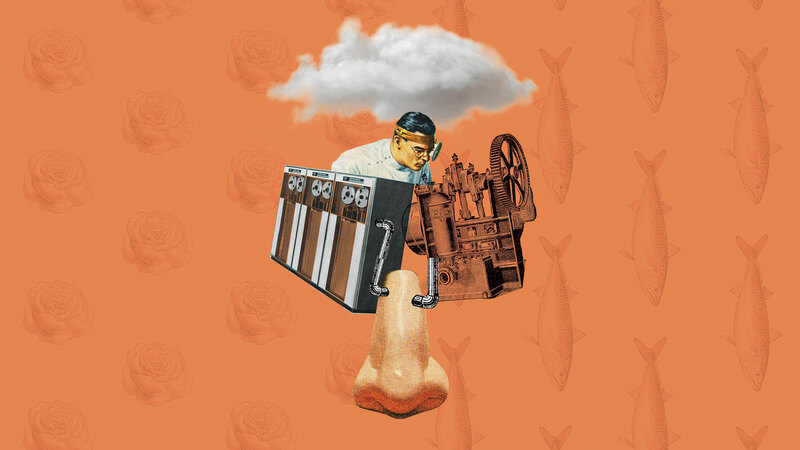 Scent has a long history as a medical diagnostic tool. Before the advent of molecular evaluation or invasive techniques, ancient Chinese healers would diagnose tuberculosis via a tarlike scent it gives off. Hippocrates sniffed patients’ breath for a fishy odor as a way to diagnose liver failure. 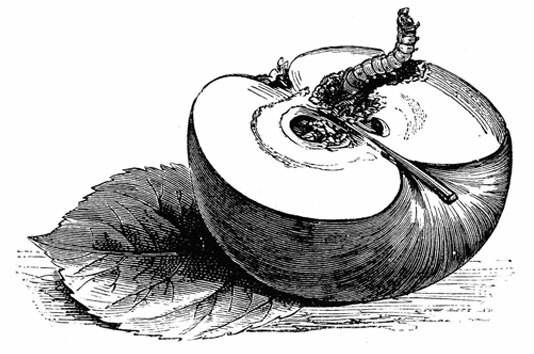 In the late 1700s, John Rollo, surgeon general of the British Royal Artillery, noted that diabetes sufferers exhibited “the odor of decaying apples” on their breath. But these ancient methods have been getting a new look in the past decade. Breath tests for tuberculosis, lactose intolerance, gum disease, pneumonia and even some forms of cancer have been the subject of academic studies or even released to the market. Canine disease detection — once anecdotal evidence — has picked up academic acolytes and seen real-world applications, with dogs now being trained to paw their diabetic owners before a meter reading even shows danger. The idea first hit Vodopyanov’s radar in 2000, when he was hired by the California startup Picarro — a group of young Stanford Ph.D.s who were trying to develop a breath analysis test for ulcers. Vodopyanov’s charge was building a laser that would be specifically tuned to find the molecules indicative of the stomach sores. He had studied physics as a student in Moscow, eventually finding a passion for lasers. “I started building my own laser on the first day of my master’s program,” Vodopyanov says — everything from the electrical engineering of the circuits to aligning the lenses and detectors. “At first, it was one day a week. Then two days a week. Then three days a week,” he says with a laugh. He was hooked. For years, Vodopyanov’s career alternated between the academic world and the private sector. After 14 years in teaching posts in Russia, Germany and the U.K., in 1999 he took a job at a company that was developing crystal technology for use in remote-sensing operations. Picarro was his next job, and he’d stay there for three years before heading to Stanford to do research. But his experience at Picarro — seeing the potential for biomedical applications of his laser work — stuck with him. Two years later, in 2005, the Nobel Prize in physics was awarded to researchers who found that short pulses of laser light would enable highly precise molecular measurements, and Vodopyanov had what he calls “his great inspiration.” It was a chance to expand beyond the startup’s limited focus. He began working on a new kind of laser — one that wouldn’t just try to find one molecule in someone’s breath but all of them. Molecules in breath can arrive there from anywhere in the body. They all use the same public transportation system: your blood. Alcohol is a good example. It travels from your mouth to your stomach, where it is absorbed into the bloodstream. When the blood circulates to the lungs, it is exchanged with air and exhaled. (“People think Breathalyzers are measuring the amount of alcohol in the stomach,” says Vodopyanov, so they’ll try — in vain — to beat police Breathalyzers by “eating crazy foods.”) The process for cancers involves a different, often more circuitous route, but the exchange in the lungs is the same. In previous methods of detection — like the one employed at Picarro — laser wavelengths were tuned to find a specific molecule. So it would help only if you knew you were looking for a specific type of disease. Vodopyanov uses the analogy of a checkout line at the grocery store: Every molecule has a bar code. The existing technology was using a scanner set to read just one of them. Vodopyanov spent the years after the Nobel announcement experimenting with how to develop a scanner that could read all of the bar codes at once. By 2009, he had a breakthrough. After making a quick study of the biology involved — “that’s the most fun, when you learn something new” — he gave his first presentation at a breath analysis conference in 2010 to a warm reception. When he was hired by UCF in 2013, it was to continue his biomedical research. These ideas have moved beyond theory. He and his colleagues are working on a prototype for a point-of-care device: The patient exhales in a tube, the doctor pushes a button to start the laser identification, and the measurements are fed into a computer for instant analysis. The prototype refinement is ongoing. Vodopyanov makes the comparison between his lab’s current work and that of a solar cell engineer. “[Engineers] are focused on improving efficiency — on making a better solar cell,” he says. “Same with us.” He wants the prototype to be more sensitive, more efficient, maybe even shrunk to the size of an iPhone. There’s much to be done. Scent can serve not only as an indicator of danger but also as a reminder of it. For veterans suffering from post- traumatic stress disorder, everyday sensory experiences can trigger traumatic memories. Fireworks may be a reminder of gunshots. The rumble of a car might recall a fateful trip interrupted by an IED. Even the smell of gas might bring back the harrowing scene after an attack. “Smells make for more emotional and stronger memories,” says Deborah Beidel, Pegasus Professor of psychology and medical education. It’s a biological byproduct: “[Memories] head right from your olfactory bulb to your hippocampus and amygdala,” Beidel says. In other words, it’s a straight run from your smell center to your emotional center. Beidel has incorporated scents into her clinical treatment at UCF RESTORES, which is focused on exposure therapy for patients with PTSD. The setup includes virtual reality headsets to provide audio and visual in addition to smells like cordite and diesel fuel, all working together to create an immersive experience for patients so they can accurately relive their trauma. The more patients relive these experiences in a safe environment, Beidel says, the weaker the link between the sound, smell or scene and the emotional response. She compares it to reversing the training of Pavlov’s dog — making it so the food bell that instantly inspired salivation is just a noise. “We are making new neuronal connections in your brain,” Beidel says. 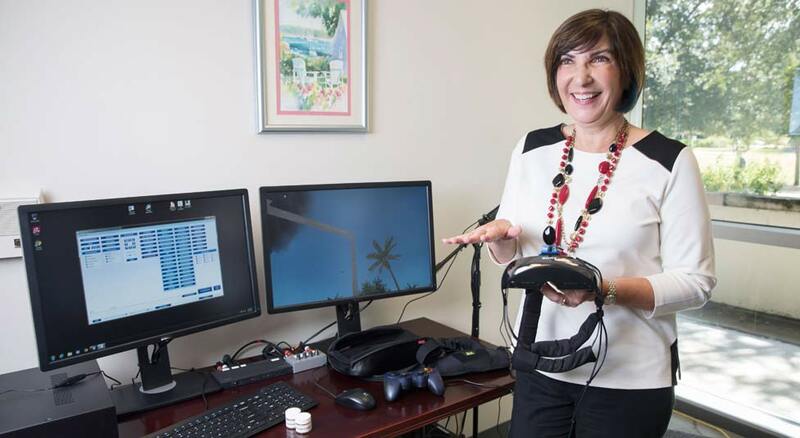 Deborah Beidel is the founding director of UCF RESTORES, which uses exposure therapy to help treat veterans and other patients with PTSD. Still though, keeping the clinic open might require expanding services to groups beyond veterans. First responders at June’s Pulse nightclub shooting in Orlando — where a gunman killed 49 and wounded 53 more — have also requested services. With so many phone calls going unanswered in victims’ pockets in the aftermath, emergency workers report that the sound of a cellphone ring has been traumatic for them. Now, Beidel says, they’ll have to figure out what scents may be haunting them too.